Home » Skin lightening » Does African Black Soap Lighten Skin? 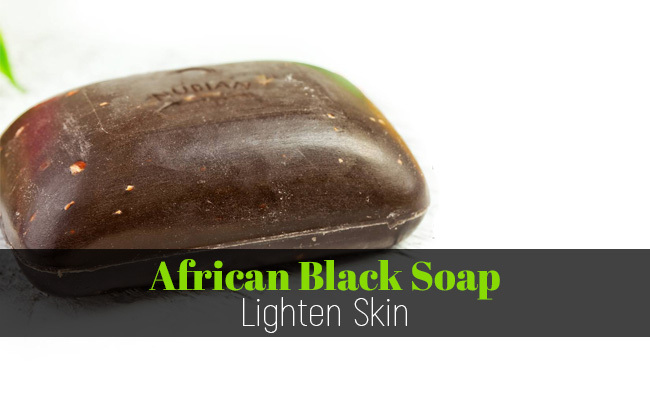 Does African Black Soap Lighten Skin? Taking care of your skin isn’t something new, and people have been using all sorts of soaps, shampoos and moisturizers for centuries now. We’ve all heard about Cleopatra’s amazing skin and it’s definite that she didn’t have the chemicals we have at hand today. How does African Black soap work for the skin? What are the effects of Black Soap on skin? Is African Black soap good for oily skin? Does African Black soap burn skin? If you’re interested in keeping your skin glowing and healthy by only using natural remedies, it’s impossible for you to not have heard by now of the African black soap. Yes, this type of soap does come from Africa, as its name suggests and we have the women from Ghana, Nigeria and neighboring countries to thank for this soap. The soap is made from all natural ingredients that are meant to keep your skin and hair clean, healthy and pretty looking for a long time! The recipe is quite simple and the 5 basic ingredients are amazing when it comes to cleansing your skin and hair, without taking away the natural oils from the skin and hair. Palm and plantain leaves present a high level or minerals and vitamins: vitamin A and E. Vitamin E is also known as the “skin protector” and it’s a strong antioxidant, whereas vitamin A increases collagen production. The leaves contain allatonin that we also find in Shea butter. It helps the skin cells renew and regenerate, reducing blemishes and scarring. No scars and no blemishes does mean whiter and brighter skin, as far as we know. Cocoa Pod contains many antioxidants that minimize risk for premature aging, but also soothe eczema, acne and various inflammatory skin conditions due to their anti-inflammatory abilities. This ingredient is also able to make your skin more form, tighter and toned, while repairing and renewing the damaged cells. Palm kernel oil/palm oil present a high content of lauric acid that is a strong antibacterial agent. It also has two forms of Vitamin E that remove free radicals and UV damage, helping with the cell renewal and regeneration. Due to its anti-inflammatory properties, palm oil is also used for easing symptoms of acne, psoriasis and eczema. Shea/Cocoa Butter is so rich in vitamin A, E, K and essential fatty acids. It’s a popular moisturizer, but it’s also fading dark marks, acne scars and spots. It also works in the case of burns, sores and damaged skin. It minimizes the appearance of wrinkles and fine lines, but is able to address inflammatory skin conditions too. As some of the ingredients may trigger allergies, it’s always wise to make sure you’re not allergic to any of the ingredients before starting using the African Black soap. Truth be told, African Black soap is amazing for skin as it contains so many vitamins, presenting impressive anti-bacterial and anti-inflammatory properties. Additionally, the soap also contains retinoid and antibiotics. This type of soap minimizes the risk of and treats rosacea, which is quite a challenging skin condition for dermatologists. The African Black soap is able to stop the burning sensation and the stinging too, that are so common symptoms for rosacea. The African Black soap is a great choice for the sensitive skin and as a common treatment for acne. A soap like this that also contains coconut is even more efficient for a dry and sensitive skin. Anyone with skin allergies and irritations may safely use the soap. The best way to maintain your skin glowing and healthy is to stay away as much as you can from skin irritations. It’s important to know that African Black soap doesn’t contain any skin irritants whatsoever. The soap is fragrance-free and alcohol free, which makes it quite gentle. There are so many factors that act on our skin daily, from the cold weather, to the drying wind, dirt and sun bacteria. It lathers easily, spreading nicely across your skin, helping you get rid of any dirt or unwanted oils that may have built up in the skin over time. The African Black soap has gone through many changes over the years so it includes nowadays many natural additives. This turn it into a more versatile soap that may address to a wider variety of skin and various types of skin sensitivities. This soap is able to insulate the skin against environmental and various biological factors. Unlike other soaps, it’s able to draw moisture, but it leaves the skin the moisture it needs. The PH level of black soap matches most skin types. African Black soap is able to brighten your skin, while maintaining its natural beauty. You should be aware though that this type of soap isn’t made specially for lightening skin. As it’s able to remove dead cells on the skin surface and lets important nutrients (vitamin A and E) in, it may look like it’s whitening the skin. What is clear about the African Black soap is that it lowers the risk of skin conditions caused by sun or cold, helping the skin remain lighter than those that aren’t using the soap. The soap works for all skin types as the ingredients are well selected. The cold process method is the most common method used when making the black soap. This way, the risk for adverse alteration of the natural ingredients is lowered. The process also gives a good amount of time to the ingredients to evenly mix so all parts of the soap have the right size and quantity of the necessary components. The African Black soap has no negative effects on the skin and it’s a popular choice for removing dead cells, letting the new cells grow. It doesn’t include petroleum, fillers, animal fat, detergents or other chemicals that you may find in the unnatural soaps. Some essential ingredients (glycerin is a good example) aren’t removed from the natural ingredients so the soap is able to moisturize, cleanse and heal your skin. All skin includes a natural protective acid that has to be kept at a certain level in order to minimize the oil level in your skin. The African Black soap is great on that as it’s not too alkaline. It doesn’t strip the skin from the natural oils and it doesn’t expose it to bacterial infections, which may lead to other skin conditions. You don’t need to scrape the skin surface when using the African Black soap. The soap is very efficient as oil glands in the skin may start to act because of scrubbing. You may gently apply the black soap and rinse it off after a couple of minutes. The African Black soap is a deep cleanser and it may even remove makeup. It moisturizes your skin efficiently, minimizing the oil production by the sebaceous glands. No matter what one may tell you, no African Black skin is going to burn skin as it has a very alkaline content. Many irritations caused by soap appear due to the high alkaline level in those soaps. It’s only some ingredients that may cause irritations in soaps so you need to pay attention to the label when buying your soap. Isopropyl alcohol, triclosan, sodium, laureth sulphate and other chemical preservatives are in fact harmful to the skin. African Black soap is a great choice for anyone who’s concerned about the health of their skin. This type of soap is made from natural ingredients that are gentle on anyone’s skin. This is the main reason for which African Black soap isn’t produced in mass. The attention of the manufacturers is increased which is why they only make small quantities at a time. When it comes to African Black soap, quality is far more important than quantity so this is why you’re not going to find it in every single store when running errands in town. You may even have to ask around or search online for it, as a matter of fact. Even though this kind of soap isn’t going to whiten your skin over night, but it’s going to heal it, renew it and removing blemishes –which does mean a whiter and brighter skin. See also our post on the Ambi black soap and the soaps for sensitive skin.